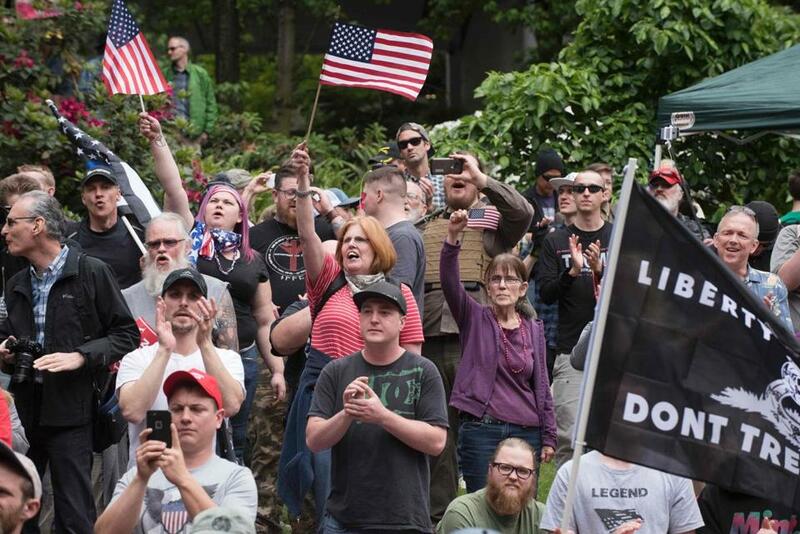 Trump supporters cheered Sunday during a rally in Portland, Ore.
Last week, President Trump announced that the United States is pulling out of the Paris climate accord. He claimed, falsely, that the treaty would hamstring the US economy and cost jobs. But if you want to know the real reason for Trump’s decision, one passage from his remarks speaks volumes — and also offers a useful reminder as to how Trump got elected in the first place. The notion that other countries are laughing at America is perhaps the only consistent line of argument that Trump has made throughout his political career. In January 2016, the Washington Post went back to 1987 and found that Trump had publicly complained “the world is laughing at” America 103 times. Read: Who are you calling crazy? These complaints would often be followed up with the promise that if Trump were elected . . . the laughing would stop. This is Trump at his core: a deeply insecure man, crippled by self-doubt and convinced that people are not taking him seriously. It is to his extraordinary political benefit that the demons that haunt him also affect the modern Republican Party and the unshakeable feelings of resentment and anger over the perception that they are being demeaned and looked down upon by liberals, Hollywood elites, and East Coast bubble dwellers. The role that racial resentment plays in energizing the Republican base has been well-chronicled, but, in some respects, the cultural resentment they feel toward liberals and elites — cultivated by generations of Republican politicians — is an even stronger motivating factor. Just as Trump is far more focused on winning than he is on governing, for all too many conservatives, giving liberals a comeuppance is their number one priority. None of this is necessarily new. Fifty years ago, George Wallace birthed the language of conservative, anti-government, anti-elitist populism with his constant and colorful attacks on Ivory Tower dwelling academics, out-of-touch political reporters, bearded bureaucrats who couldn’t park their bicycles straight, “pseudo intellectuals,” and liberal elites who tried to force white Americans to racially integrate their communities. In Wallace’s telling, these same liberals lived in all-white communities, sent their kids to private school, and didn’t care at all about the impact of their policies on working class communities. The image of liberals trying to force “social progress” on these “hard-working” primarily white Americans would become perhaps the most effective piece of political ammunition for a generation of Republicans, particularly as millions of white Americans saw their previously privileged status steadily eroded by the gains of non-whites. But few would channel that rage as explicitly and effectively as Trump. During the 2016 campaign, Trump supporters, without fail, would praise him for having the guts to say things that were politically incorrect. This was one of the few constants. People didn’t necessarily agree with what he said — in fact more often than not they didn’t. But his willingness to say things that clearly enraged liberals was the equivalent of political catnip for Republican voters. You can see this in the way Republicans approach the climate change issue, in general. It has little to do with the environment, but rather with liberals becoming hysterical about the environment — and Trump producing “liberal tears” by smacking them down. Never mind that many prominent Republican CEOs, most of Trump’s Cabinet secretaries, and even the US military recognize the seriousness of the issue. For Pence and Trump, it’s about who stands with “real America” and who does not. Just as Wallace decried liberals being hypocrites about racial integration 50 years ago, liberals are today being hypocrites about global warming. It reminds me of a conversation I had after the election with an anti-Trump Republican who voted for Hillary Clinton. While he bemoaned Trump’s victory, he took some solace in the tears of devastated liberals. It’s a recurrent refrain on the right. Resentment, be it racial, cultural, or economic, and an overwhelming desire to tick off liberals are the glue that holds the conservative movement and the Republican Party together. It is liberals that have eroded traditional cultural values, prized the environment and regulation over “real Americans” doing “real work” and given blacks, Hispanics, women, gays, and of course, immigrants a hand up — while pushing them down the economic ladder. It’s not just about policy — it’s performative too. Conservative antipathy extends to the media, Hollywood, and practically any champion of not just diversity or multiculturalism, but of social change. Plenty of conservatives hated Barack Obama because he’s black. But the fact that he’s cosmopolitan, Harvard-educated, and worked as a community organizer — rather than in a job where he might have gotten his hands dirty — didn’t help much either. Obama, in simply his appearance and demeanor, was for many Republicans a reminder of how much the country had been transformed — and to them, not for the better. On the right, it’s the only true consensus — and one Trump tapped into with such effectiveness in 2016. Never mind that a significant percentage of Democrats are black and Hispanic and tens of millions live in red state America or that most liberals and progressives spend very little time blaming poor red state residents for their plight. The overriding image of the modern Democrat (and particularly modern liberal) is that of a latte-sipping, America-hating, Ivy League graduate who wears sandals or square glasses, wouldn’t know what to do with a rifle in their hand, and looks down his or her nose at real, working-class Americans. This cultural chasm is also why the intense polarization of modern American politics is not going away any time soon. Conservatives don’t just view liberals as being wrong, they view them as being somehow illegitimate. It’s why Democrats who think the path to winning over Trump’s base of supporters is via better political messaging and targeted economic policies are kidding themselves. And it’s definitely the reason that Trump, no matter what he does or says, will likely maintain the backing of his core supporters. Sure, he’s a billionaire faux populist whose policies do some of their greatest damage to his fervent backers. Sure, he surrounds himself with corporate CEOs and conservative ideologues who don’t give a lick about helping the white working class. Sure, his administration is stunningly incompetent. He’s sticking it to liberals and that’s good enough for them.